I haven’t eaten much in West Philly, save for a couple of trips to Dahlak and maybe some random visits around campus. I had a delightful meal at Marigold Kitchen last weekend. I can’t stop raving about the place. The place is in a row home, and it’s truly like you’re just eating in someone’s house. It’s sparse, yet warm and colorful. There is a room in the back that looks to be perfect for bigger parties, and then multiple two tops in the main dining area. It’s a byob, so don’t forget to bring a bottle. They’ll provide excellent stemware (damn, I just said stemware in my blog). Marigold got a new head chef fairly recently and the short and sweet menu has tons of southern influences. 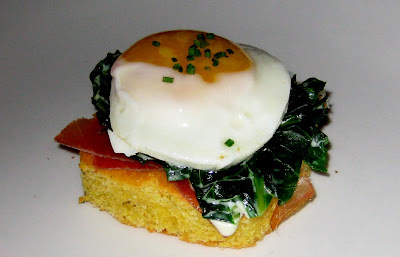 J started with the cornbread with collards, ham, egg. Really great actually, and I’m not into greens much. I got the grits and shrimp. Holy crap this was good. I could have eaten a giant bowl. It’s not like I’m all that into grits, heck, I’ve probably tasted it maybe only a couple of times in my life. But when in Rome I say. 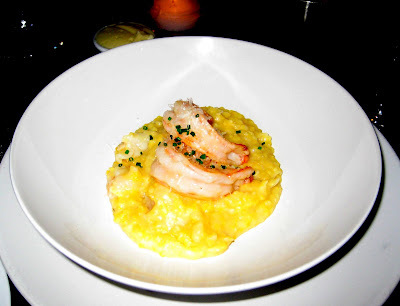 These were smooth and cheesy with hunks of shrimp in and on top of the grits. Hot diggity. I practically licked the bowl. 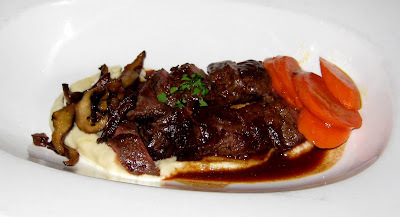 For the main course, J went with hanger steak with cauliflower puree, cooked medium. Mmm… this was really good. I don’t even know what else to say. Sorry I can’t be more prolific. 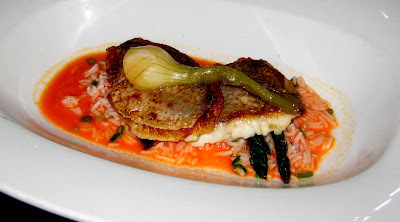 I went with the red snapper with rice, asparagus, spring onion. Damn, I’m out of words for this too. The fish was cooked perfectly, so the skin side was slightly crispy. I don’t even know what kind of sauce it was in, but I just love, love, loved it. Again, I practically licked my plate. I would have if there weren’t other diners around. Marigold serves human-sized portions, as opposed to cheesecake factory portions, so there’s actually room left for dessert. J got the banana bread pudding with coffee ice cream and I got the apple tart with sour cream ice cream. 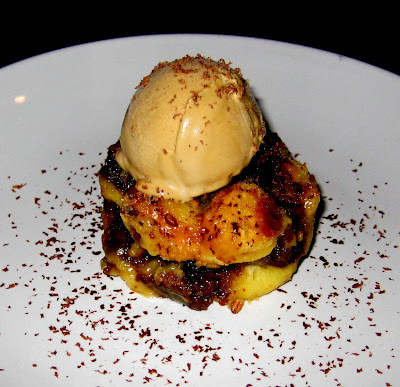 I read that the banana bread pudding wasn’t that great, but screw that, it was tasty! 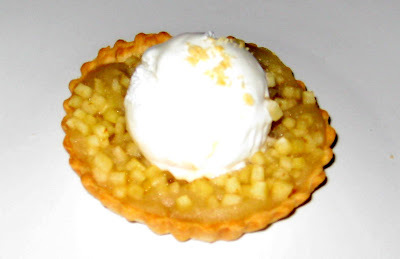 As for my tart, it was excellent. The crust was crunchy yet flaky, and the sour cream ice cream? Does anybody know where I can buy sour cream ice cream? If so, please please let me know. It was awesome, just awesome. The service here was great. The waitress was helpful, friendly, and attentive. The food came out fairly quickly. All the other diners looked happy to be there and seemed to be enjoying the food. I highly recommend this place to anyone. It’s a nice alternative to the more student-oriented spots in the area. That night, there was plenty of parking on the street, and not at all scary to walk around. So don’t be frightened, and venture out to Marigold for a surprisingly nice meal.